The deforestation of the Amazon is about to reach a certain limit from which regions of the rainforest can undergo irreversible changes, in which their landscapes may become similar to those of cerrado, but degraded, with sparse and sparse vegetation and low biodiversity. The alert was made in an editorial published on Wednesday (21/02) in the journal Science Advances. The article is signed by Thomas Lovejoy, a professor at George Mason University in the United States, and Carlos Nobre, coordinator of the National Institute of Science and Technology for Climate Change - one of the INCTs supported by FAPESP in the State of São Paulo in partnership with the Council National Scientific and Technological Development (CNPq) - and retired researcher of the National Institute of Space Research (INPE). "The Amazon system is about to reach an inflection point," Lovejoy told Agência FAPESP. According to the authors, since the 1970s, when studies carried out by Professor Eneas Salati demonstrated that the Amazon generates approximately half of its own rainfall, the question arose of what would be the level of deforestation from which the hydrological cycle would degrade to the point where it could no longer support the existence of tropical forest ecosystems. The first models elaborated to answer this question showed that this inflection point would be reached if the deforestation of the Amazon forest reached 40%. In this scenario, the Central, Southern and Eastern regions of the Amazon would register less rainfall and have a longer dry season. In addition, the vegetation of the South and East could become similar to that of savannas. In recent decades, factors other than deforestation have begun to impact the Amazonian hydrological cycle, such as climate change and the indiscriminate use of fire by agriculturalists during dry periods - with the objective of eliminating felled trees and clearing areas to turn them into crops or pastures. The combination of these three factors indicates that the new inflection point from which ecosystems in the eastern, southern and central Amazon can be no longer forest could be achieved if deforestation reaches between 20% and 25% of the original forest, the researchers point out. The calculation is derived from a study by Nobre and other researchers from Inpe, the National Center for Natural Disaster Monitoring and Alarms (CEMADEN) and the University of Brasilia (UnB), published in 2016 in the journal Proceedings of the National Academy of Sciences . "Although we do not know the exact inflection point, we estimate that the Amazon is very close to reaching this irreversible limit. The Amazon has already 20% of deforested area, equivalent to 1 million square kilometers, although 15% of this area [150 thousand km2] is in recovery, "Nobre said. According to the researchers, the megassecas registered in the Amazon in 2005, 2010 and between 2015 and 2016, may be the first indications that this turning point is close to being reached. These events, along with the severe floods in the region in 2009, 2012 and 2014, suggest that the entire Amazon system is wavering. 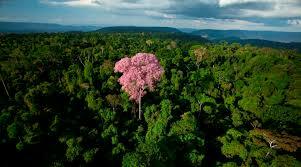 "Human action enhances these disturbances that we have observed in the hydrological cycle of the Amazon," said Nobre. "If there was no human activity in the Amazon, a megasseca would cause the loss of a certain number of trees, which would grow again in a year that rains a lot and, thus, the forest would reach equilibrium. But when you have a megasseca combined with the widespread use of fire, the regeneration capacity of the forest decreases, "explained the researcher. In order to prevent the Amazon from reaching an irreversible limit, the researchers suggest the need not to control the deforestation of the region, but also to build a safety margin by reducing the deforested area to less than 20%. For this, in Nobre's assessment, deforestation in the Amazon will have to be zeroed and Brazil will fulfill the commitment made in the 2015 Paris Climate Agreement to reforest 12 million hectares of deforested areas in the country, of which 50,000 km2 are Amazon. "If deforestation in the Amazon is zeroed and Brazil fulfills its commitment to reforestation, by 2030 the fully deforested areas in the Amazon would be around 16% to 17%," Nobre calculated. "In this way, we would be at the limit, but still safe, so that deforestation, by itself, does not cause the biome to reach an irreversible point," he said. The Amazon tipping point editorial (doi: 10.1126 / sciadv.aat2340), signed by Thomas Lovejoy and Carlos Nobre, can be read in the journal Science Advances . The article Land-use and climate change risks in the Amazon and the need for a novel sustainable development paradigm (doi: 10.1073 / pnas.1605516113), by Carlos Nobre, Gilvan Sampaio, Laura Borma, Juan Carlos Castilla-Rubio, José Silva and Manoel Cardoso, can be read in the PNAS magazine at http://www.pnas.org/content/113/39/10759.